In its 21 years, the Methow Valley Chamber Music Festival has gravitated from a meadow in Mazama to a horse arena outside Winthrop to its current location in a barn that affords expansive views of the valley—and top-notch acoustics. The 2016 season is the Festival’s eighth in the barn, perched high on Signal Hill between Winthrop and Twisp. Converting the former show-horse barn into a suitable setting for chamber music required countless hours of donated labor and professional input about how to maximize the sightlines and sound in the rustic structure. In 2009, volunteers and hired contractors ripped out horse stalls, feeding areas, and oversized veterinary equipment, essentially gutting the barn. They built a stage and relocated beams to create good views of the musicians, and added decorative metal railing and oversized sculpted violin scrolls, both created by local artists. Perhaps the most important change was the barn’s acoustical upgrade, with the addition of a hard-packed, crushed-rock floor engineered to provide just the right amount of reverberation for chamber music. In subsequent years, the Festival board and volunteers added more amenities on the grounds, where concert-goers can enjoy a picnic before the concert or linger afterwards with musicians around a fire pit. 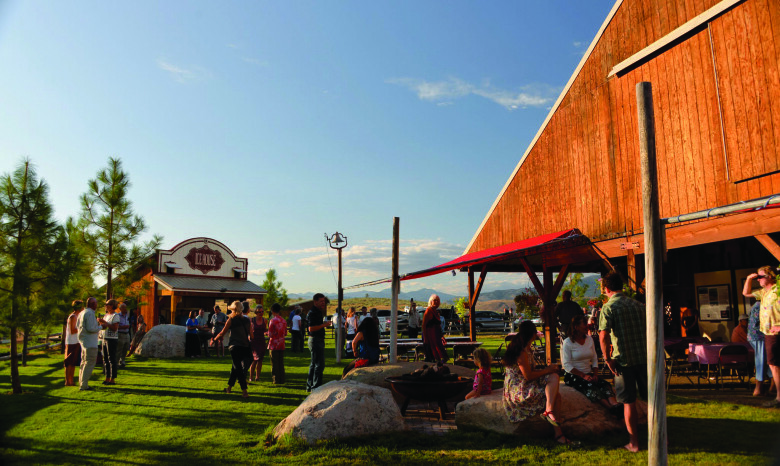 Immense flat-topped boulders—some weighing 40,000 pounds—were relocated from elsewhere on the property to provide casual, comfortable seating outside the barn. The Festival venue preserves the outdoor appeal of the original meadow while offering the ability to close barn doors to block noise and distractions, and to adjust for less-than-optimal weather. Last year, the owners of Signal Hill Ranch added a piano garden, a sculptural installation of a dozen pianos that concert-goers can experience just a short walk from the concert barn. The pianos, which had outlived their utility as musical instruments, have been reimagined as works of art. Future plans for the barn include a new performance stage and canopy. The 2016 summer festival runs from July 28 through August 6.